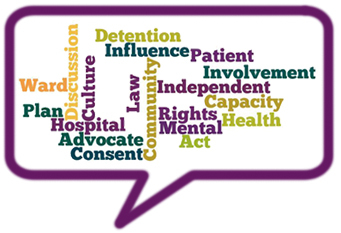 In our third annual report into the use of the Mental Health Act, we share with you some of the key findings from our visits to mental health patients throughout 2011/12. Around 23 per cent of illnesses that people suffer in England are attributed to a mental health problem. Our job is to ensure that these people receive care that supports their basic human rights. Our visits to mental health services are carried out by Mental Health Act commissioners. Throughout 2011/12, our commissioners visited 1,546 wards, of which 811 were unannounced and 95 took place on weekends. Commissioners spoke to patients and staff, checked care plans and other documents, examined the state of wards and more. In this report, you'll read our findings of the experiences of patients, and information on how the Act is used, care plans, the amount of involvement patients have in the decisions about their treatment, consent to treatment and more. Next: What is the Mental Health Act and how is it used? What is the Mental Health Act and how is it used? Are care plans focused on individual needs? Are patients involved their care? Are patients given the opportunity to give consent? Is there a culture of control over patients? 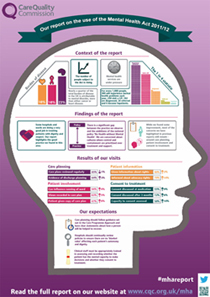 Visit Mental Health Act Annual Report 2011/12 infographic to view it in full. You can also download our infographic below. Find out about the performance of care services in England.